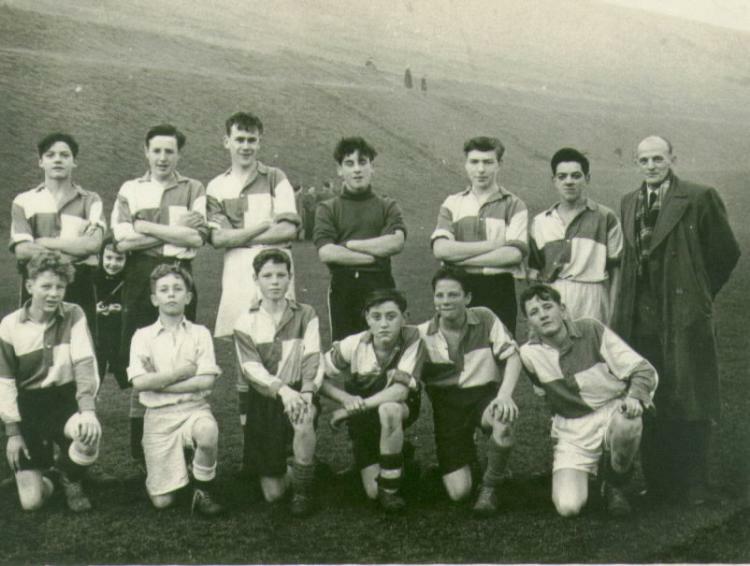 Here is a photograph of the 8th Coy Boys’ Brigade football team taken at Whitehawk football pitches in the late 1950s. The lads’ names from left to right back row: Michael Groves, Jim Type, Keith Salvage, Raymond Chatfield, Brian Constable, (Capt) Derek Collingham, our skipper Mr Collingham. Front Row: Trevor Standing, Geoffrey Standing, Chris Barker, Roy Newland, Ron Pope, Colin Humphreys. We lost to the London Boys’ Brigade team 2 – 0!! As this is titled “Whitehawk Football” I’ll tell my story. I was born and raised in Sadler Way,a ten minute walk from the Enclosed Ground at East Brighton Park. Home since the early 60’s of Whitehawk FC. As a youngster I used to go with my mates and bunk in round the back to watch Whitehawk play in the County League. Ray Allcorn was their goalie at the time and he used to chat to us kids behind the goal and he quickly became my hero. In 1973 I went along with a neighbour to train with the team. Although I was only 13 years old, established players like (my hero) Ray Allcorn, Frankie Tribe, John Ansbro and Brendon Quirke made me really welcome. I wanted to be an outfield player really, but was playing in goal for Brighton Boys Under 14’s at the time. I sort of kept that a secret and was playing in “Hoppy” Burtenshaw’s team as a right winger until I got busted when Brighton Boys played a Cup Final at East Brighton Park, and of course I was in goal. Ray Allcorn then persuaded me that I really should be training properly as a keeper and took me under his wing. I played my first game in the first team aged 14. Something I doubt would be allowed to happen now. Subsequently I got noticed by a few Pro clubs and ended up signing for Brighton in 1977 after being on schoolboy forms for a couple of years. I was a bit small for a keeper,had a couple of bad injuries and a real attitude.LOL.I did the non league circuit and ended up back at Whitehawk as coach to Butch Reeves. Butch left and I went on to be manager during some tough times. Once we stayed up in Division One with the last kick of the last game of the season. We did win the Brighton Charity Cup three times though. I had some great times at Whitehawk Football Club and met some lovely people. I now live in Spain where I have been for five years and work as a PE Teacher in a private school. My Uncle Dennis Shipley used to be a referee for the football in Whitehawk. Does anybody know him? Dennis was a neighbour and good friend of my brother Michael Sutton during their school and teenage years. He also coached my husband Derek through the referee’s exam. Thanks Wayne, have tried to email you but come back undelivered, try mine at jenrog@hotmail.com. Would love to hear how they are after all these years. Regards, Jenny Rogers. Hi Barbara, message from Dennis - love to hear from you. Still in Whitehawk with my wife Mary. Hi Dennis and Mary, would love to get in touch with you, but obviously need contact details. Tried to email wayne, but the message bounced straight back. Sorry haven’t been on this site for ages and have only just found your request. You can contact me at barbaraetherton@yahoo.co.uk and I look forward to hearing from you. Still living and working in Spain. Whitehawk FC seems to have changed beyond all recognition. For good or bad remains to be seen. I remember Dennis Shipley in his butchers shop – I worked in the other butchers shop over the road, Tony Mitchells. I was doing my apprentice there in the early 70s.